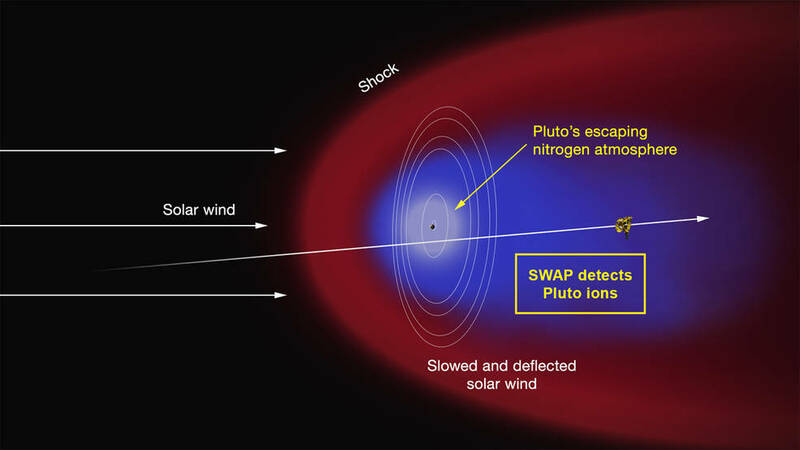 July 20, 2015 – New Horizons has discovered a region of cold, dense ionized gas tens of thousands of miles beyond Pluto — the planet’s atmosphere being stripped away by the solar wind and lost to space. Beginning an hour and half after closest approach on July 14, the Solar Wind Around Pluto (SWAP) instrument observed a cavity in the solar wind — the outflow of electrically charged particles from the Sun — between 48,000 miles (77,000 km) and 68,000 miles (109,000 km) downstream of Pluto. SWAP data revealed this cavity to be populated with nitrogen ions forming a “plasma tail” of undetermined structure and length extending behind the planet. Plasma tail formation is but one fundamental aspect of Pluto’s solar wind interaction, the nature of which is determined by several yet poorly constrained factors. Of these, perhaps the most important is the atmospheric loss rate.